I will guide the participants through a gentle exploration of mobilizing joints, differentiating internal and external movement tendencies and the effort we undertake to execute them. We become aware of the moulding quality of our gestures and how they shape our articulations. During this section we will not stop moving for about half an hour although I will change the indications throughout that stretch of time. The aim is to deal with the challenge of organizing the breathing and the muscular effort in such a way that moving without stopping becomes like the underlying state on top of which other tasks have to be put into practice and/or explored. Especially this part of the class is inspired by images of visual art work with surrealistic, distorted, fragmented or even abstract representations of the body. In my choice of examples I will be very clear and prepared but the way the participants will deal with the suggestions remains within their personal approach. At the end of the session there is time to come back to one self and to get into resonance with the experiences. Similar to the contemporary class we will start with a specific functional theme of the body or a prominent body part that can be explored by touching a partner with the fingers to get a deeper and intuitive understanding for our supporting structure. Within the flow of the session we gradually blur the boundaries between my body and the other body and visualize sculptural images from external sources. By internalizing this images as a sort of inspiring form we want to achieve together with our partners, we practice a series of try-outs leading towards organizing this images. – I am fascinated by the fact that the most complex and beautiful partner constellations suddenly appear out of an ease of two or more bodies moving as one. How can we subsequently process, memorize and integrate such information as tools? 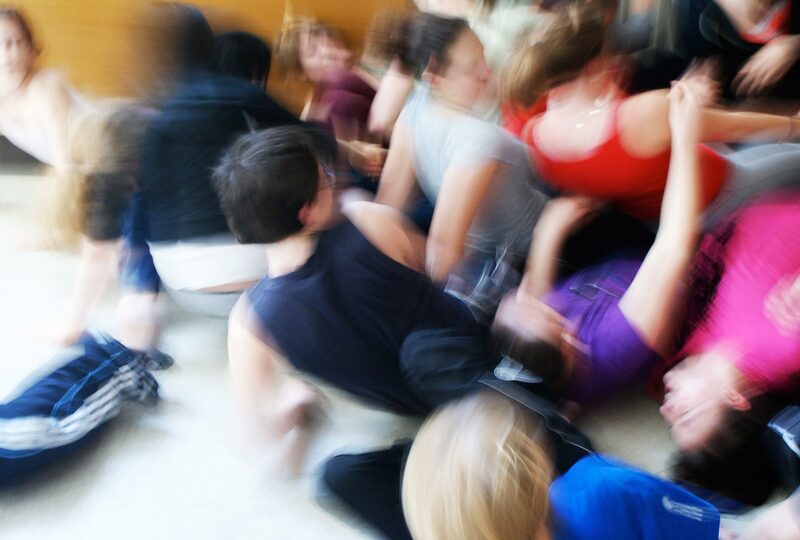 Georg Blaschke and Vienna-based Feldenkrais Practitioner Sascha Krausneker have developed a special format of team-teaching over the last years to investigate into possible connections between the Feldenkrais Method and the field of contemporary dance and performance practice. They have collected a wide range of experiences teaching in different contexts such as workshops at dance institutions for professional dancers, programs for dance education and for performing arts projects. The process of documentation in a form of a regular sharing on a verbal level with the group is an inherent part of the methodology of our teaching proposal. It helps to mirror both the ongoing process as well as the roles as teachers and facilitators within the process. With the Feldenkrais Method we can learn to move with ease and to enlarge our comfortable movement range. The Method is a unique and revolutionary approach to the understanding of human learning, movement and function. At the beginning an ATM – Awareness Through Movement lesson proposes a certain functional theme. Sometimes it can already include moments of partner work to sensitize touching qualities in the sense of following other persons’ small movements hands on. Transition into space: During this very delicate period the group is accompanied from an inside towards an outside awareness into space by giving enough time to integrate sensations, play with and open up movements, qualities and vision. Improvisation and movement research: Certain improvisational guidelines to explore movements, contact and how the bodily articulation is represented in the surrounding space lead to a gradually extended group presence and eventually to challenging tasks of partner work and dance dynamics. Choreographic implications might be introduced. At the end of the lesson there is enough time to come back to one self and to get into resonance with the experiences of the entire class and the original Feldenkrais lesson. This special format needs a certain time frame to facilitate a flow from the beginning to the end of the class, so that 150 to 180 minutes are the optimum length. The workshop usually has a general theme with a suggested length of at least one week with a group. In this context Georg uses the notion choreography both as a tool for creation as well as for communication. The format is specially designed for students of Arts Education, Arts Management and Master programmes of Dance and Choreography and is based on three directives: 1. Somatic practice and teaching practice, 2. Reflexion and documentation, 3. Creation and performance. The aim is to support the students to develop and differentiate their personal didactic knowledge by starting with the body and the actual environment of group and space. During the process Georg shifts the focus between physical work, self-organized performances, try-outs, showings, talks and discussions, short lessons, writings and conceptual work. Thus different levels of experience, learning and expressing are triggered. At the end of the seminar a creation by the students plus a written document conclude the programme. During the last years Georg Blaschke has been teaching at the following institutions: ImPulsTanz – Vienna International Dance Festival, Tanzquartier Vienna, Konservatorium Wien University, Kibbutzim College of Education Technology and the Arts Tel Aviv, SNDO de Theaterschool Amsterdam, International Dance Conference Bytom and Theatre University Cracow, Centre for Theatre Practices Gardzienice, The Hong Kong Academy For Performing Arts, Codarts Rotterdam, IDA Institute of Dance Arts Linz, k3 Tanzplan Kampnagel Hamburg, SEAD Salzburg Experimantel Academy of Dance Croatian Institute for Movement and Dance Zagreb, University of New Mexico. In the frame of I like to move it, move it – the big school project of Linz09 Cultural Capital – Amanda Piña and Georg Blaschke have been working with pupils of two schools in Upper Austria during a period of eight weeks on movement and dance.